Feeling nostalgic about COM ports? So are we and our motherboards. This article will be a brief overview of what to expect when adding COM ports to a modern computer. First, we need to define “COM port” because even Google thinks COM ports are irrelevant. Communication port or COM port is the asynchronous serial data transfer between devices. USB is the standard serial communication protocol, forsaking all others. 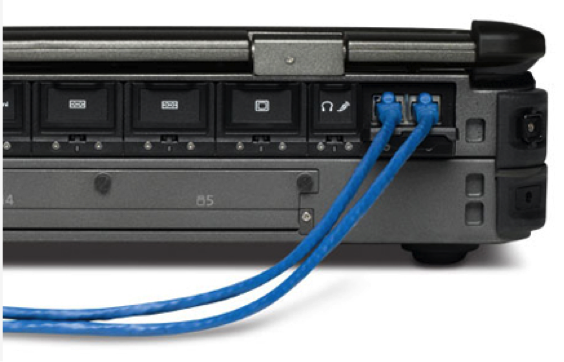 So why add COM ports to your system? There is an existing population of legacy systems that still require COM ports. Sensors, PLCs, and other controllers. *Links to vendors and pricing is for information purposes only and not an endorsement of the product. Do your research to find the best product and price for you. TTL (Transistor-transistor Logic) – typically a single transmission line accompanied by a ground wire. 0V to 0.8V is low/ “0”, 2V to 5V is high/ “1”. RS232 $ – Similar to UART but with voltage levels between -25V and +25V. Extra signal flag wires. Only 1 commanding and 1 listening device. RS422 $$ – Similar to RS232 but with differential TX and RX lines. Extra single flags. Only 1 commanding device and multiple listening devices. RS485 $$ – Similar to RS422 but with multiple commanding and multiple listening devices. 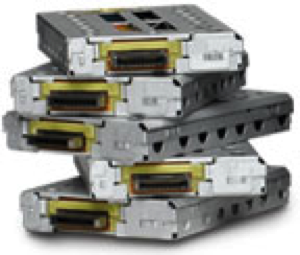 The most common and inexpensive ways to add COM ports is use PCI-E or USB components. 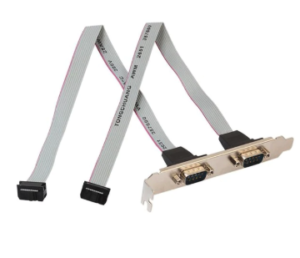 Most motherboards do NOT have a native COM port and straight connection bracket will not work. If the motherboard DOES have a native COM port, 99% of the time it is only UART/RS232. The COM port does not have differential pins to support RS422/RS485 so don’t expect native RS422 on a motherboard. A PCIE card is your best bet for building in COM ports to a system. 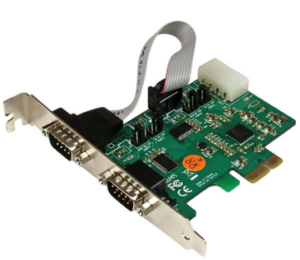 The card can work in any PCIE slot as it only takes 1 lane for a dual COM port card. A USB to Serial cable is a great solution if the device needs to move between systems. The downside is having to install a driver everyone time on new systems. 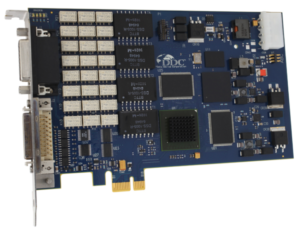 1553 PCI and PCIE cards are typically used for military and avionic vehicles. The cards have various options and not something you will find on Amazon or an electronics store. USB versions are also available for a similar price. 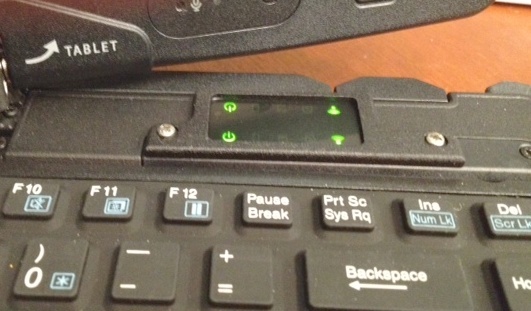 The AGS-MRPC is quickest rugged, portable computer solution if you need COM ports. 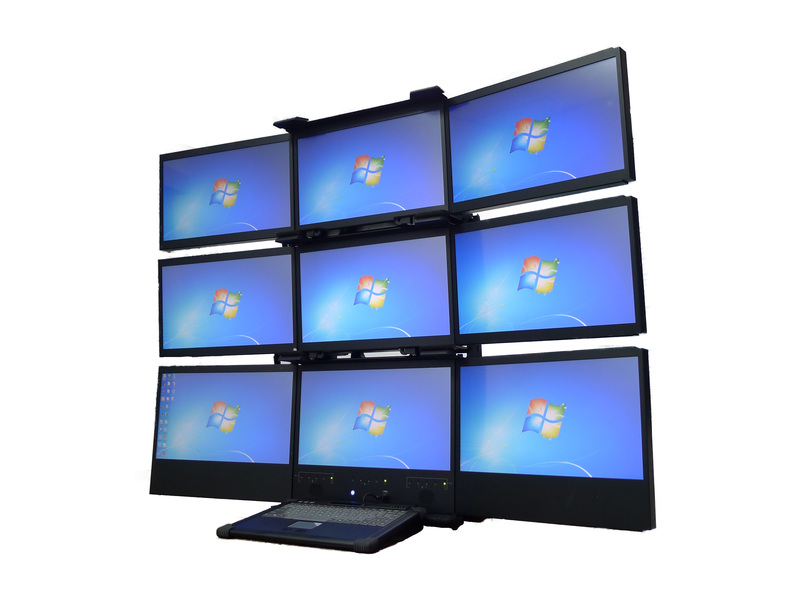 Or if you need more space and more screens, the AGS-MILPAC has capacity and power to control a whole warehouse. 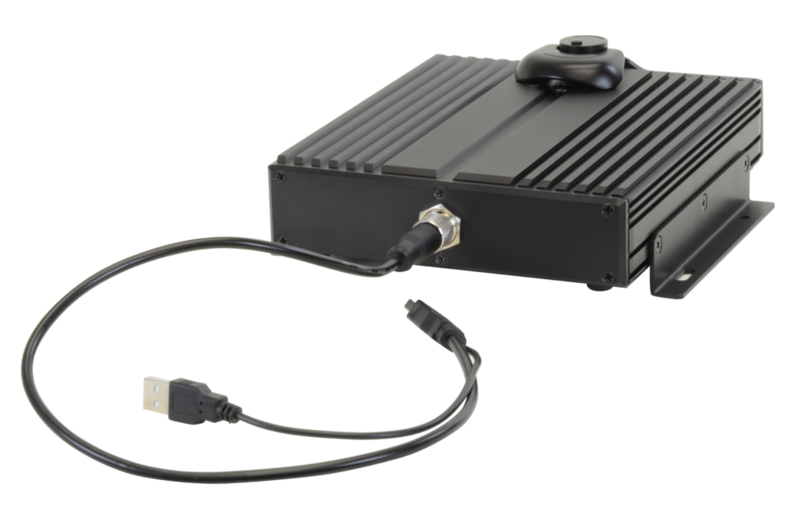 Military and aerospace users of the Getac X500 server can now power their systems from a vehicle or aircraft power system using PCG’s 150W DC/DC power adapter. The adapter can also support high performance laptops like the Alienware 17 and the Asus ROG and other high performance gaming laptops. 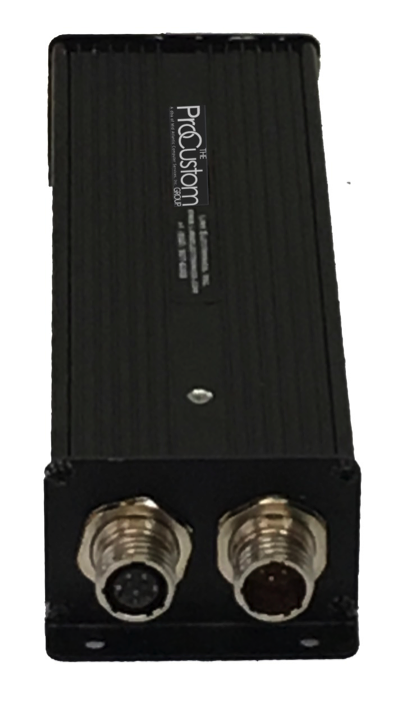 The PCG-150-MIL 150-watt adapter accepts DC inputs from 20-30VDC and is optimized for 24VDC and 28VDC military vehicle and aircraft power systems. It has a nominal output of 19VDC +/- 5% for the Getac X500 server but can be delivered with a 16V, 18V or 24V output on special order. The adapter is compliant with the requirements of MIL-STD-1275D with the exception of operating through the starting disturbances described in section 3.1.6 of MIL-STD-1275D however, the adapter withstands exposure to these starting disturbances without damage. The 150-watt DC/DC adapter will operate to full performance within the temperature range of -40°C to +55°C., including internally generated sources of heat as well as the ambient temperature. The operating temperature requirements have been verified in accordance with MIL-STD-810G, Method 501.5, Procedure II (high-temperature), and Method 502.5, Procedure II (low-temperature). The server adapter will operable within performance specifications after exposure to ambient temperatures of -40°C to +63°C. These requirements have been verified in accordance with MIL-STD-810G, Method 501.5, Procedure I (high-temperature), and Method 502.5, Procedure I (low-temperature). The MILSPEC 150-watt DC/DC laptop power adapter was operable without performance compromise after exposure to rapid changes in ambient temperatures over the operating range of -40°C to +49°C in accordance with MIL-STD-810G, Method 503.5, Procedure I; Figures 503.5-1, 503.5-2, and 503.5-3 (a total of 4.5 cycles). The transfer time between temperature extremes did not exceed 1 minute. 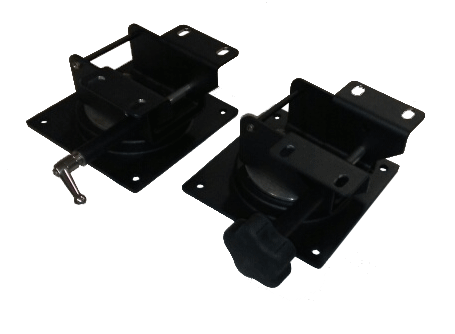 The adapter was fully functional to its performance specifications after being subjected to functional vibration profiles found in military vehicles for eight (8) hours in each axis, in accordance with MIL-STD-810G, Method 514.6, Category 20, Ground Mobile equipment. The laptop DC/DC server adapter was fully functional after being subjected to secured cargo vibration induced by air transportation both packaged and unpackaged after being subjected to fixed wing turboprop and turbine aircraft vibration. The Equipment met all performance requirements during and after exposure to the functional shock for ground equipment requirements of MIL-STD-810G, Method 516.6, Procedure I, Table 516.6-II, Terminal Peak Sawtooth. The Getac server adapter mounting provisions and structure successfully withstood the transient shock test loads imparted by the crash hazard shock for ground equipment in accordance with MIL-STD-810G, Method 516.6, Procedure V, Table 516.6-I. The DC-DC adapter successfully withstood exposure to dust particle size <150 µm in diameter, density of 10.6 ± 7 gm/m3, with particle velocities of 1.5 to 8.9 m/s from all direction in accordance with MIL-STD-810G, Method 510.5, Procedure I; 90 minutes per side, four sides total. The adapter withstands the effects and degradation associated with contamination from exposure to fluids that may be encountered over the service life in accordance with MIL-STD-810G, Method 504.1, Procedure II (Small Systems). 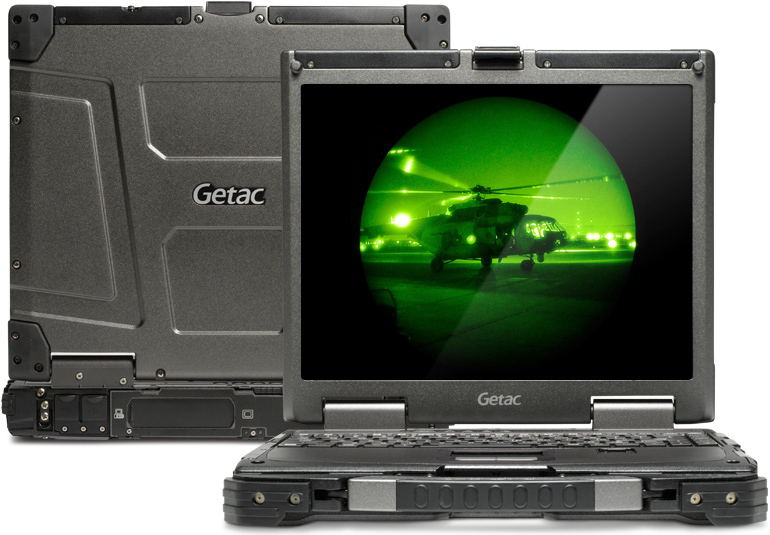 The high power 150-watt Getac X500 laptop adapter meets all of its performance requirements after exposure to un-pressurized transportation altitudes of up to 12,192 meters (40,000 ft) above sea level in accordance with MIL-STD-810G, Method 500.5, Procedure I. The MILSPEC DC/DC adapter will operate during exposure to low pressure altitudes up to 4572 meters (15,000 ft) above sea level in accordance with MIL-STD-810G, Method 500.5, Procedure II. The adapter (non-operating) will withstand altitude changes of 10m/sec. (1969 ft/min.) from 12,192 meters (40,000 ft) above sea level in accordance with MIL-STD-810G, Method 500.5, Procedure III. When connected as installed in a complete system, the adapter can tolerate cleaning without damage using hot or cold water and steam from a high pressure low-volume cleaning system and commercially available detergents by fine spray, spray-applying a mixture of detergents and water, and rinsing with clean water. 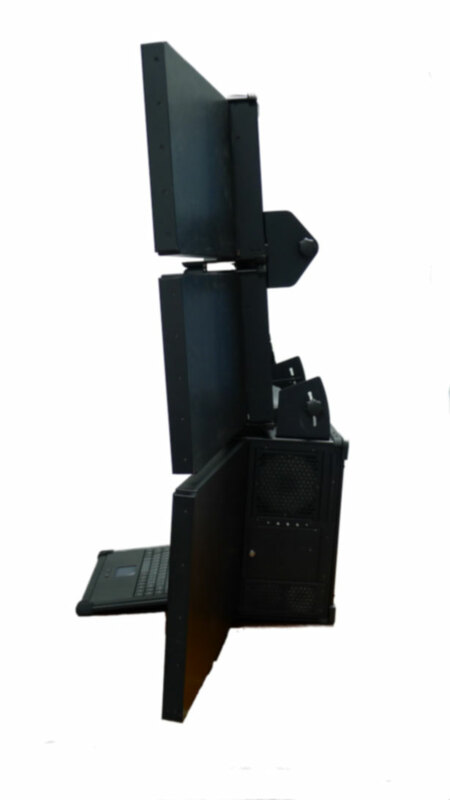 The server adapter will withstand and continue to operate after exposure to electrostatic discharge events in accordance with MIL-STD-1686C, ESD Class 2 voltage levels applied to the Human Body Model (HBM) test locations. MIL STD 901D is intended to simulate the conditions that occur on board a ship when it is struck by a torpedo. The equipment must survive without throwing off pieces that might injure crew-members. In this test, an X500 that has been modified by ProCustom Group for ship-board use was subjected to multiple shocks. 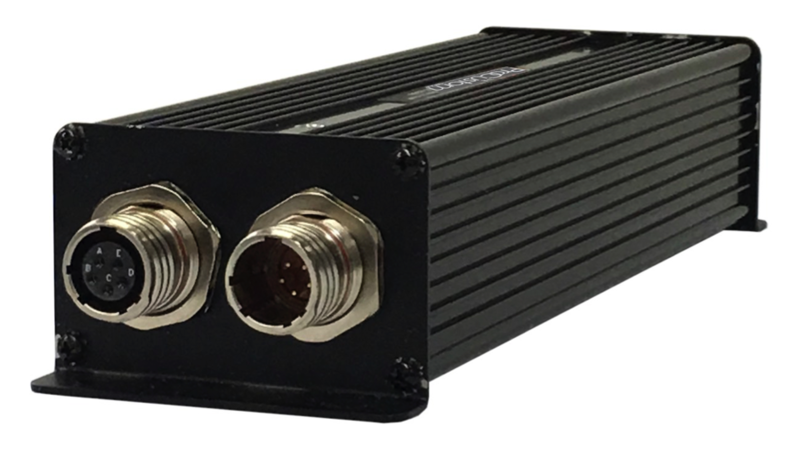 The modifications included significant additional i/o through mil-spec connectors via an expansion slice and custom interface boards, secured in an adjustable custom mount. If you listen carefully there is one test where there is a loud clanging sound, followed by the utterence of “uh oh!” If you look carefully it was just a wrench that had been left on the test fixture by mistake, and turned into a projectile. No wrenches or personel were seriously injured in the making of this video. 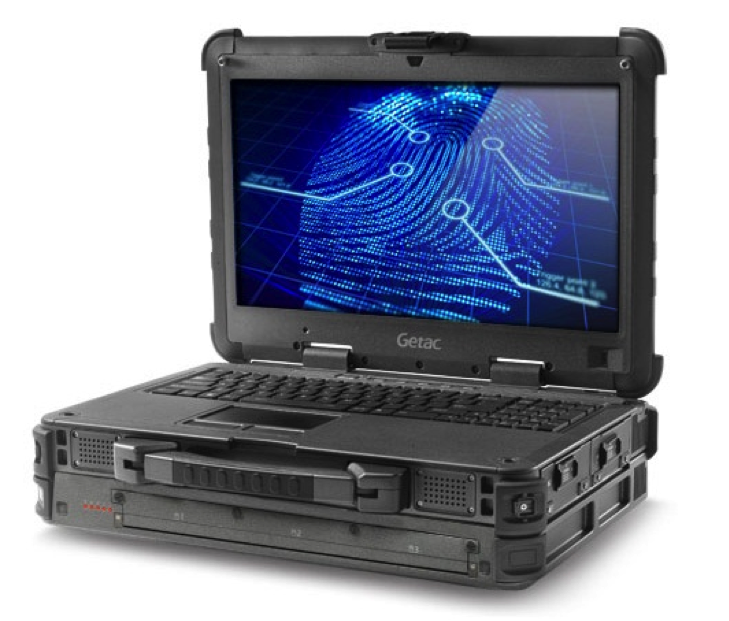 ProCustom Group specializes in the modification of Getac rugged laptops for use in real world, hostile environments. These include ship-borne, aircraft, tracked vehicle, flightline and oilfield applications. 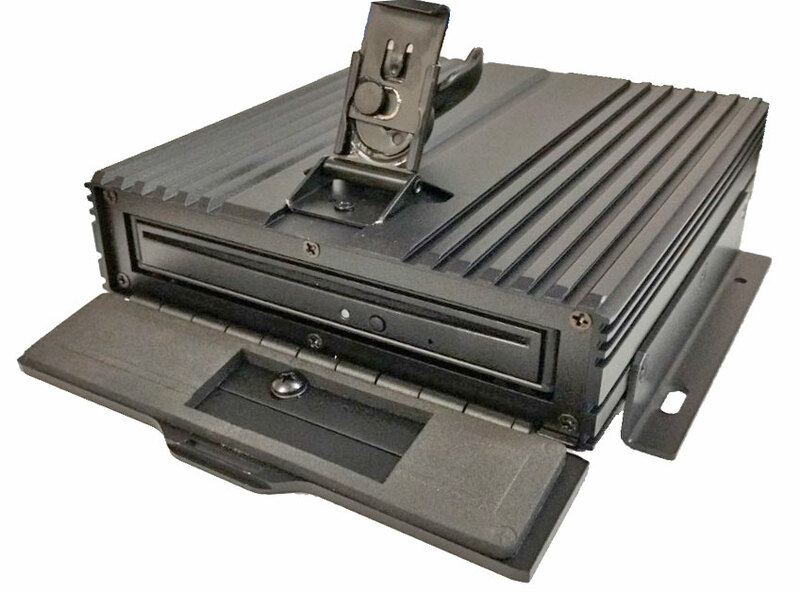 Military customers that need a transportable DVD player / writer that can survive deployment conditions (MIL-SPEC DVD) now have an off-the-shelf solution. 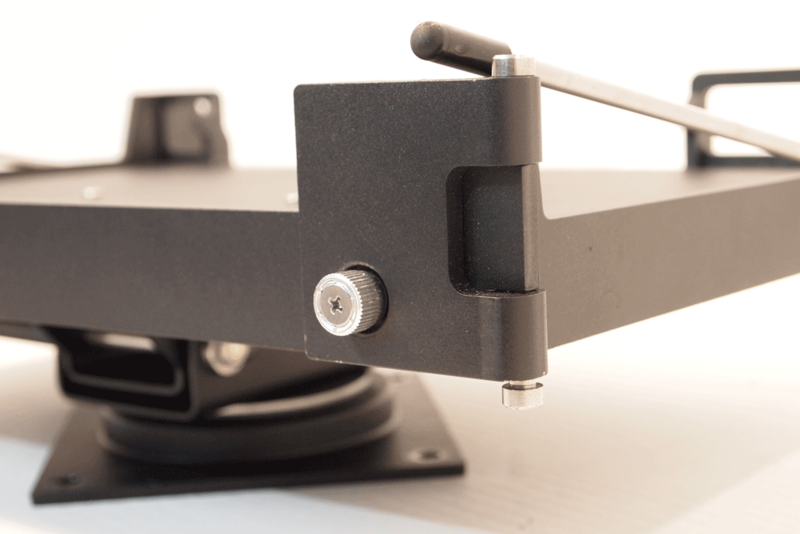 By mounting a high-quality transport mechanism, with a multi-format DVD-R/W or Blu Ray drive in a machined case, and protecting from shock and vibration using sorbothane mounts, ProCustom Group was able to significantly ruggedize a portable DVD. 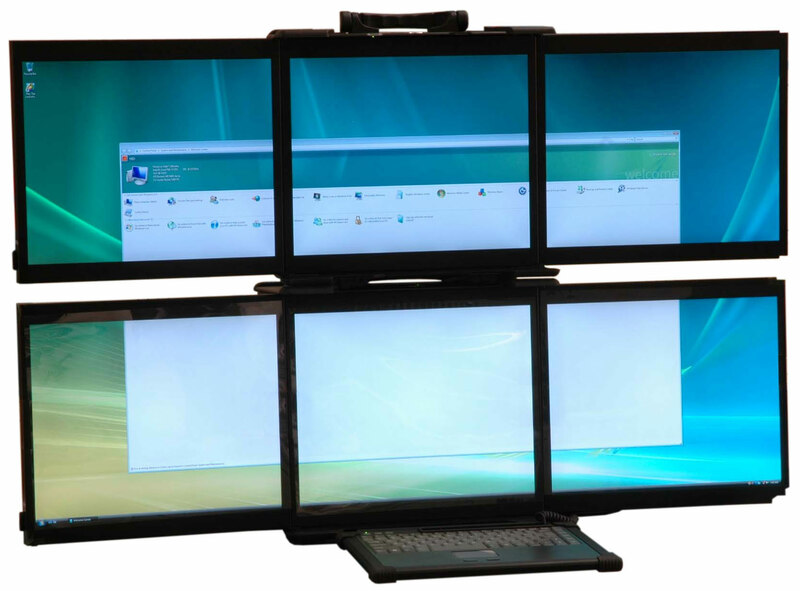 The system is significantly more robust than any other commercially available system. Military users still need access to read-only media such as DVDs due to concerns about viruses and trojans. 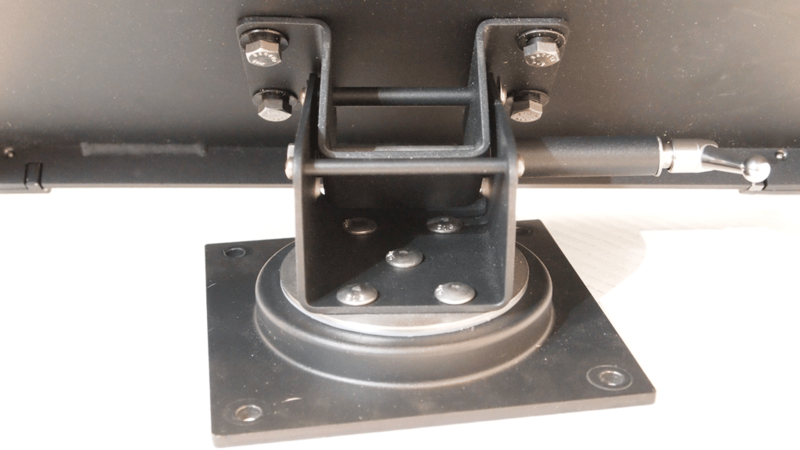 Substantial mounting tabs are provided to allow mounting to military vehicles, deployed C4ISR racks or other rugged environments. A choice of cabling is offered depending on the environmental conditions anticipated. When closed, the PCG-X-DVD-EXT is sealed from dust and driving rain. Designed to meet Mil-STD 810G. 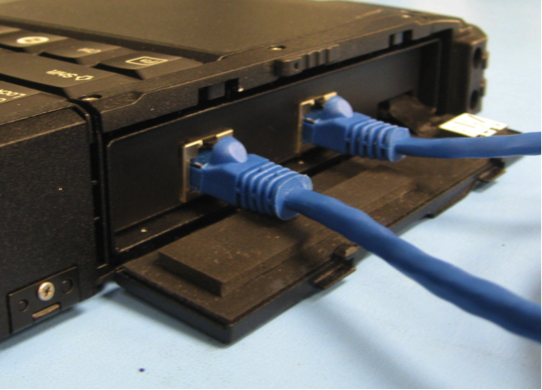 Removable USB cabling also available with 38999 connectors at additional cost. 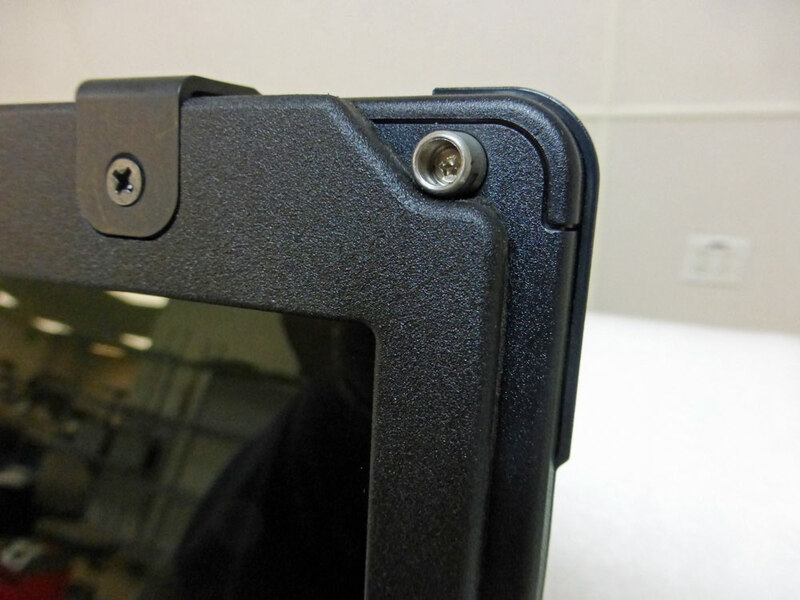 Substantial tabs for secure mounting. Rotating clamp ensures tight seal. 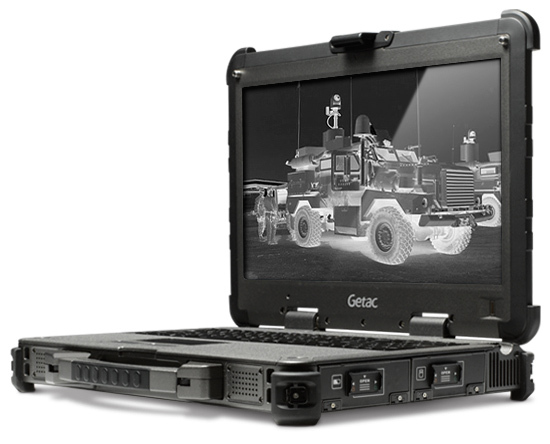 ProCustom Group now offers Linux installation on the Getac V110 rugged notebook / convertible. 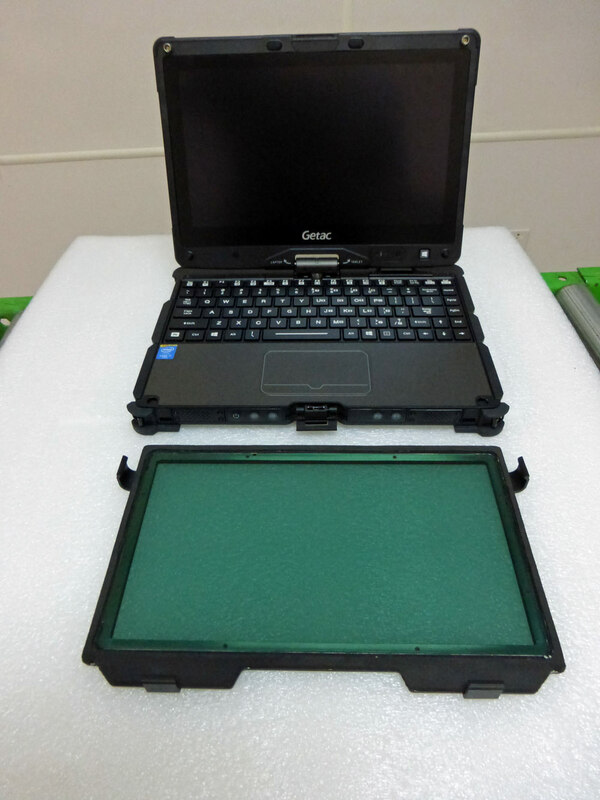 The Getac V110 is a very compact, robust and lightweight convertible notebook computer. Weighing in at under 2Kg or 68oz, and combining composite and die-cast magnesium construction it is a pleasure to use. Intel i5 or i7 processors and HD5500 graphics mean plenty of performance – and with all the storage being solid state the V110 is snappy and responsive. 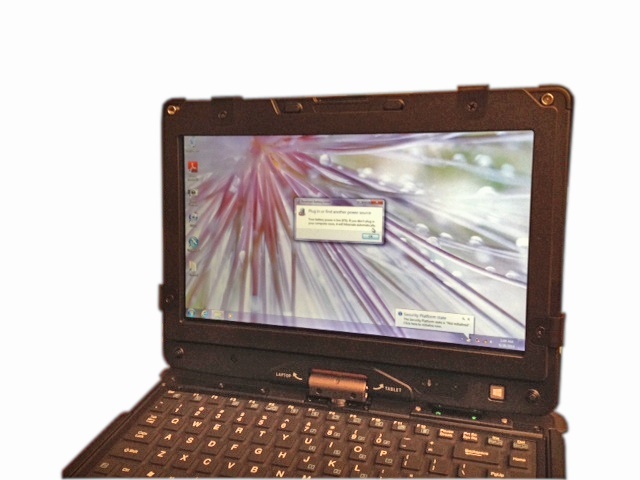 This rugged laptop linux installation is available now from The ProCustom group as both part of a comprehensive suite of customization options or as an add on service. 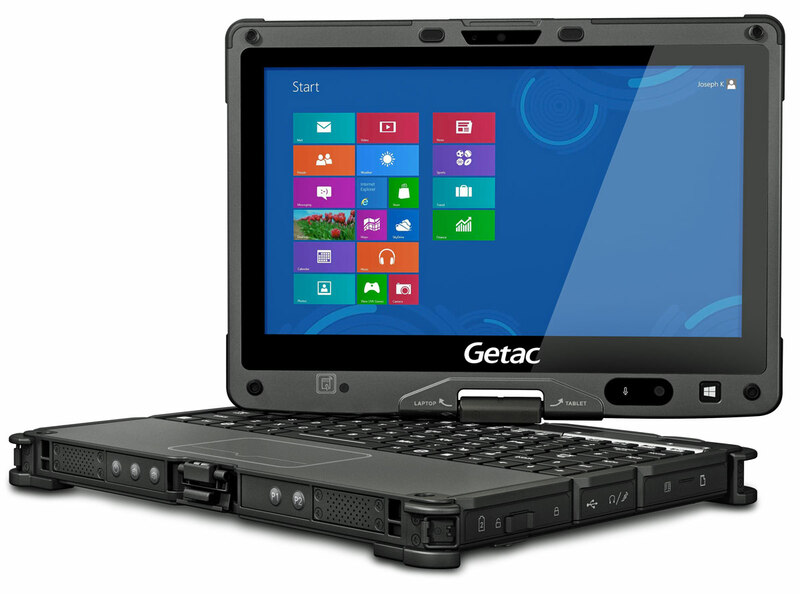 The internal hardware of the Getac V110 convertible notebook and F110 rugged tablet are quite similar, and although untested, it seems likely that Ubuntu would work just as well on the F110 ruggedized tablet. 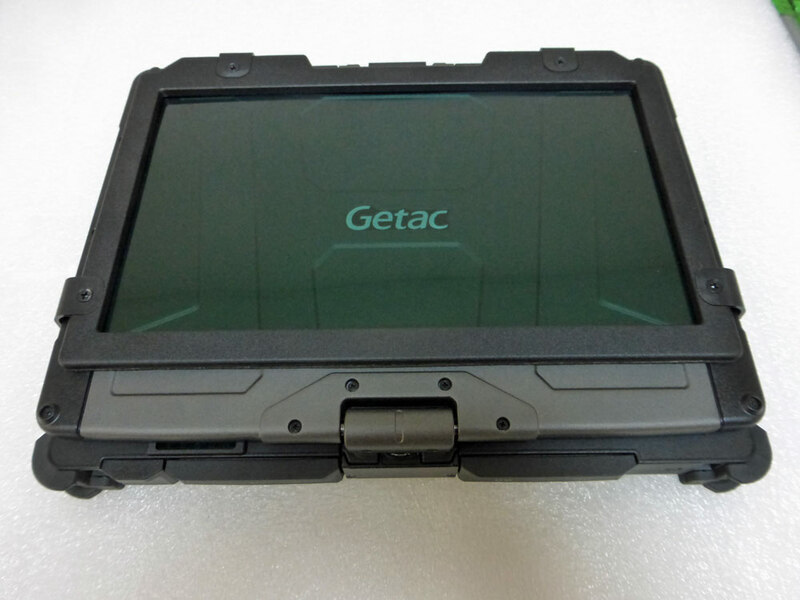 Pro Custom Group has developed an NVIS system for the Getac V110 rugged convertible tablet. Complying with dod-std-3009 the add-on filter makes the V110 usable when wearing night vision goggles. Night Vision Imaging Systems (NVIS) and Night Vision Goggles (NVG) allow their users to see in the dark. (Almost – there has to be some light to amplify) Military requirements for search and rescue, night combat, surveillance operations and sniper sights drove the development of these systems, but they are now available to the civilian population for hunting etc. I met a guy in London in about 1996 who was making a fortune selling them to voyeurs who lived near Hyde Park, and wanted to watch what was going on after dark… The first systems were installed in tanks in WWII. Since then they have improved dramatically and have been miniaturized to the extent that they can now be head mounted – night vision goggles (NVG). They work by amplifying a relatively narrow band of the near infra-red and optical spectrum. Indeed the first systems includes powerful infra-red lamps to illuminate the viewing scene. Later generations became more and more sensitive, so much so that the latest systems work fine in starlight. Why Does the Laptop need to be NVIS compatible? The backlights for the laptop display, and indeed indicator lamps on the main housing (LEDs!) are blindingly bright when viewed through night vision goggles. This is not just distracting, it can be deadly. An NVIS compatible computer has narrow bandwidth filter that attenuates the frequencies amplified by the night vision system. So the filter blocks infrared and near infrared light, which means it no longer looks like a searchlight when wearing the NVS goggles. So what does it look like without the goggles on? It looks like a laptop with a very slightly dimmer display than standard. A modern, Haswell based (Intel® Core™ i7-4600U 2.1GHz processor ) portable computer is now available with Night Vision compatibility. Contact ProCustom Group for details. So you have to hand it to Tiger Direct. Nice April Fool, and well executed. When you went to their site on April 1st 2014, this is the newsworthy product! 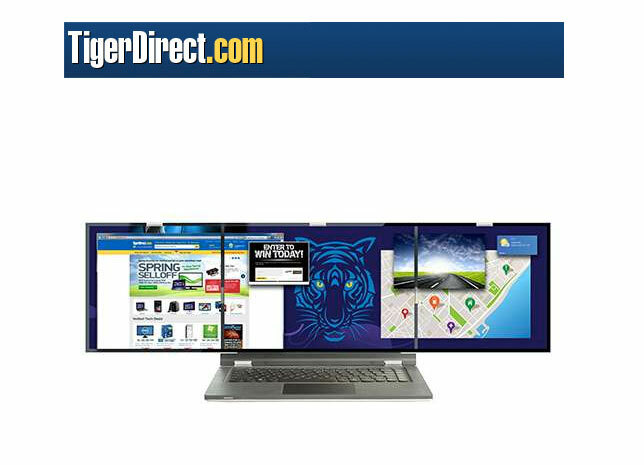 When you click for more information, or actually try and buy it, Tiger Direct popped up a box proclaiming “April Fool!” – and offered a $10 off voucher. 2 x Intel Xeon E5’s, 512GB RAM, 500GB SSD RAID boot drives, 12TB HDD RAID storage, 3 x 17″ HD displays (option for 6, or 9) and high-end video cards and video capture system. Four Gigabit LAN ports, security card reader etc. 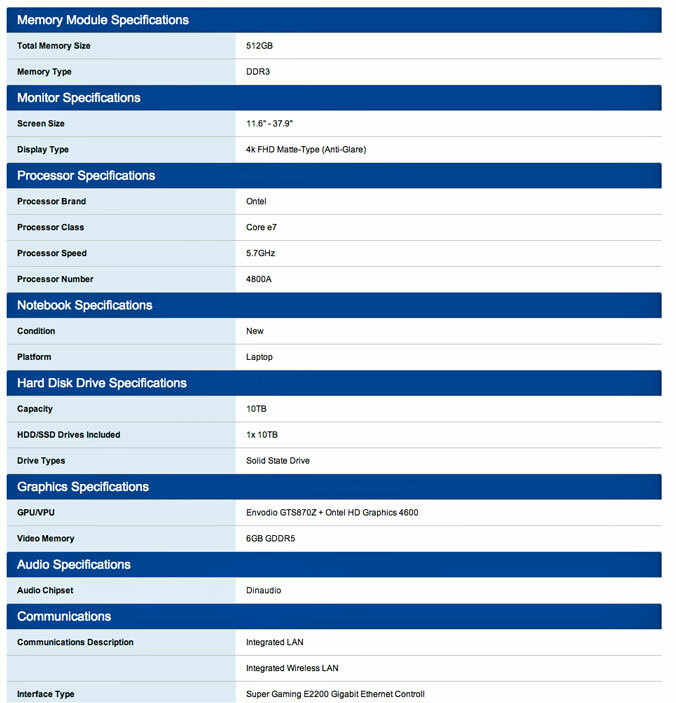 Intel Xeon’s are better than Ontel chips. 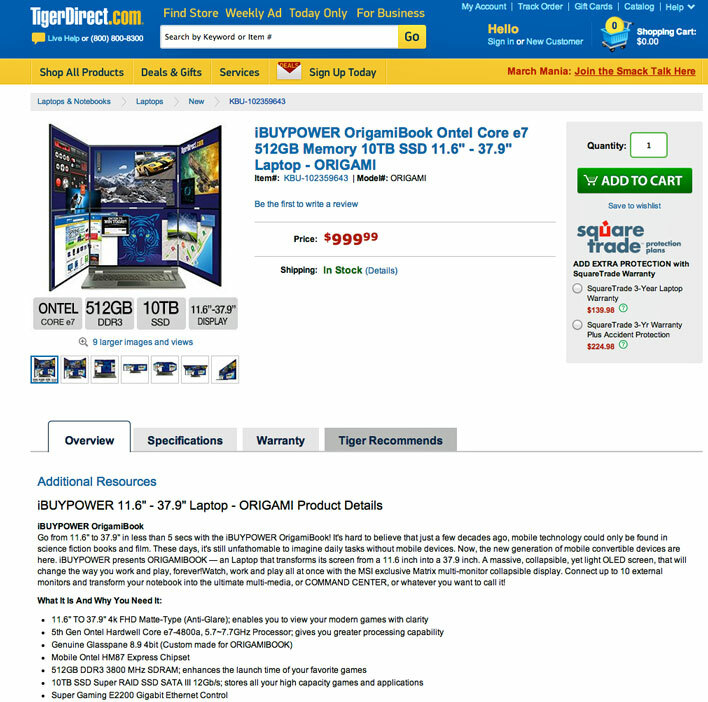 Nine display rugged workstation – origami – pah! 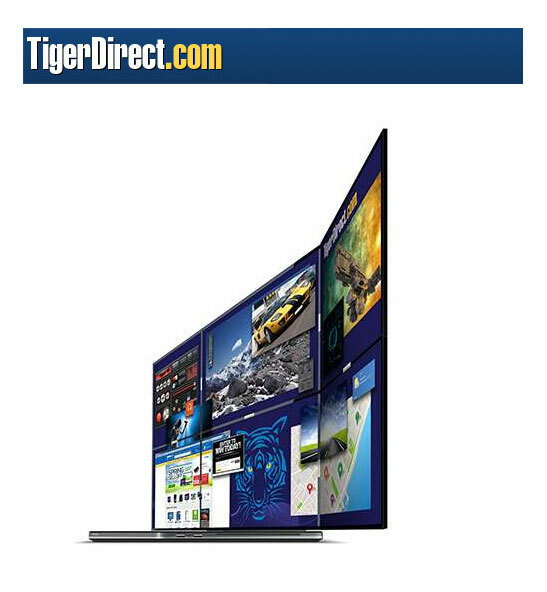 The 4K displays mentioned in the prank origami unit are not available in 15″ or 17″ just yet, but there will be some 24″ portable computers with 4K displays available soon. If interested, please use the contact form, or visit ACME portable at the NAB show. 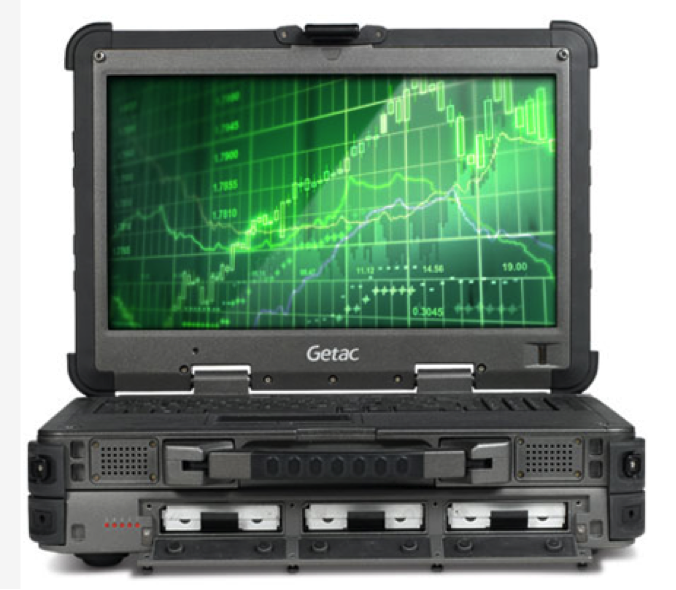 The “Big Dog” of portable laptop servers is now available with a customized Quad-LANs, the first in portable server from Getac. The new generation laptop multi-LAN server has a state-of-the-art 1.73 GHz Intel Core i7 quad core processor outfitted with 16GB of RAM and 8MB Intel® level 3 Smart Cache. 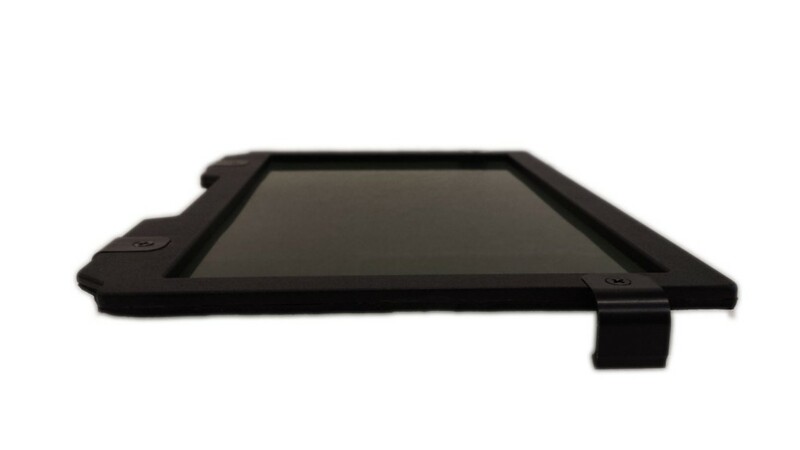 The X500 Rugged Server was built to handle the most complex processing tasks, and yet still features a sunlight readable display and water resistant contruction. 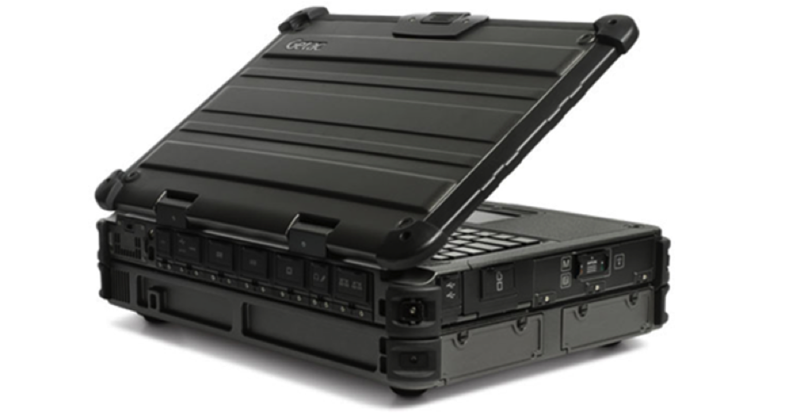 At 16.1 x 11.4 x 4.7 inches in size, the briefcase-size X500 Rugged Customized Server can be easily carried and deployed, maximizing uptime and efficiency. Self-contained, the X500 Server was designed to be brought to the front line and started up with the same simplicity of a standard notebook. 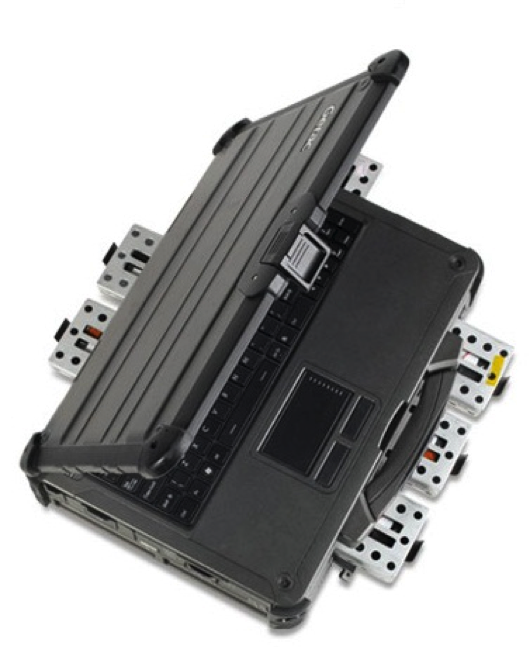 The rugged multi-LAN server’s drives are housed in removable shock & vibration protected carriers allowing easy removal for secure storage. The X500 Rugged Server is pre-loaded with Windows Server 2012 providing powerful and flexible server application management. Storage & Memory: 8GB DDR3 1333MHz Expandable to 16GB, SATA 500GB HDD, Three SATA 1TB Hard Drives – RAID 0, RAID 1, RAID 5 Disc Management (Expandable to five SATA 1TB hard drives). Night vision systems (often abbreviated NVG for night vision goggles) are becoming a common accessory for military personnel. Care needs to be taken when combining image intensifiers with laptop displays though… especially sunlight-readable, high brightness displays! Standard monitors (CCFL-backlit LCDs and CRTs) emit high levels of IR radiation, specifically the kind that’s amplified by night vision goggles. This causes blooming (washed out view) and over-saturation, which renders the user effectively blind. This is true even if the monitor is in the proximity of the user but not in their direct field of view. NVG Systems – how do they work? Night Vision Goggles work by using a photo-multiplier to take the very low level of light that is available (starlight, moonlight, infra-red light) and amplifying it. First the photons are converted into electrons by a photocathode, then the electrons are ‘multiplied’ by a high voltage gain stage before striking a phosphor screen. The phosphor screens glow green (like my old TRS-80 CRT!) giving the image the typical green hue of most night vision systems. The B300 is MIL-STD 3009 certified, meaning its screen can be seen with night vision goggles – but without the need for filters. By using a quick key, the B300 transforms into a night vision imaging system (NVIS). In daylight, the device offers a 1400nits sunlight-readable QuadraClear touchscreen display, granting users complete visibility under bright sunshine. For customized versions of the B300 and X500 (mil-spec connectors, vehicle mounts etc) please contact pro custom group. The Getac B300 the ideal choice for marine environments such as the Coast Guard, or on the deck of a ship, where salt air can affect equipment performance drastically. 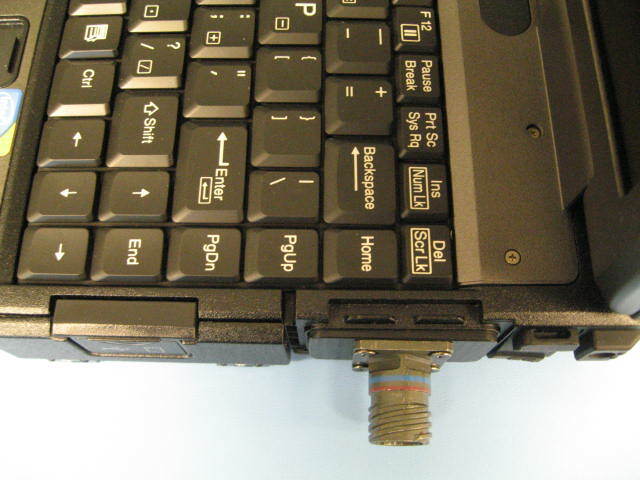 Salt is one of the most corrosive chemicals commonly found, and can cause damage to the metal housings and electrical connection on all laptops – even ruggedized or Mil-Spec ones. Salt fog testing for military products generally follows procedures described in MIL-STD-810G 509.4 Salt Fog, with a vapor spray salt solution of 5% salt water introduced in a test chamber to create a salt fog environment. Testing usually includes 48 hours of exposure followed by another 48 hours of drying time. However, two successive cycles of 24-hour exposure / 24-hour drying is an even more challenging scenario for this particular test. Getac used the 24/24/24/24 test for the Getac B300. 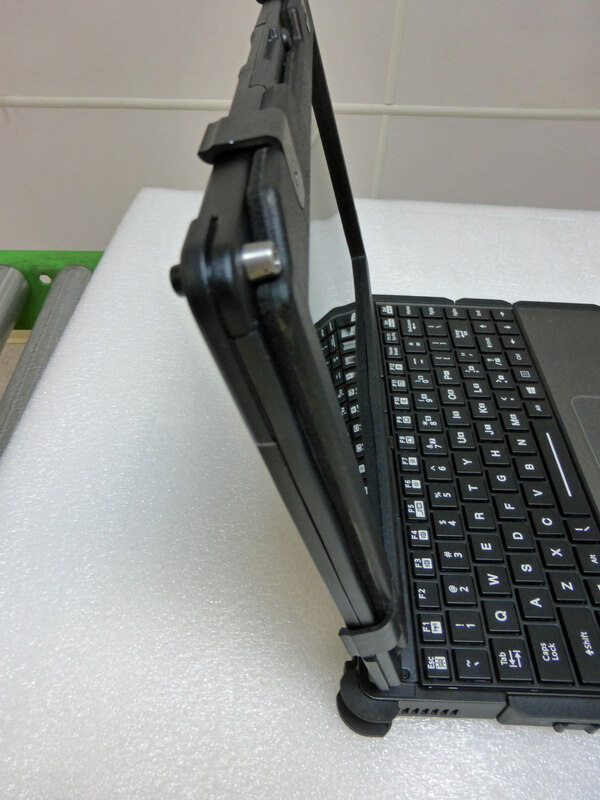 To pass this test, the laptop needs to have excellent mechanical design, but also a high quality surface treatment for the magnesium alloy case parts. Magnesium surface treatments include chemical conversion and painting. Getac’s magnesium factory created a chemical conversion treatment system that includes a special pre-treatment to clean and prep die-cast magnesium surfaces before the chemical conversion process is applied. Their chemical conversion treatment is not limited to plain phosphate, it also contains calcium phosphate, vanadate and other salts. After the Mg alloy is chemically converted, it is capable of passing the salt fog test unpainted. For increased durability, and to make the unit look nice, a special mil-std paint is applied. The standard Getac B300 passes IP65 waterproofing tests. This is a pretty severe test – but is not enough to pass salt fog tests. Any salt water entering the unit is likely to cause corrosion; especially to the electrical circuitry. Keyboard drainage, cable in/out structures and microstructures throughout the entire machine are required to prevent salt deposits caused by standing salt water. This effectively prevents structural damage from clogging or binding within the mechanical structure, and also helps avoid electrical malfunction due to corrosion. Of course, if you have to use the laptop and connect it to power, or any other electrical connection – eg drone data port, 1553 bus, physical network connection, – you will need corrosion resistant connectors. 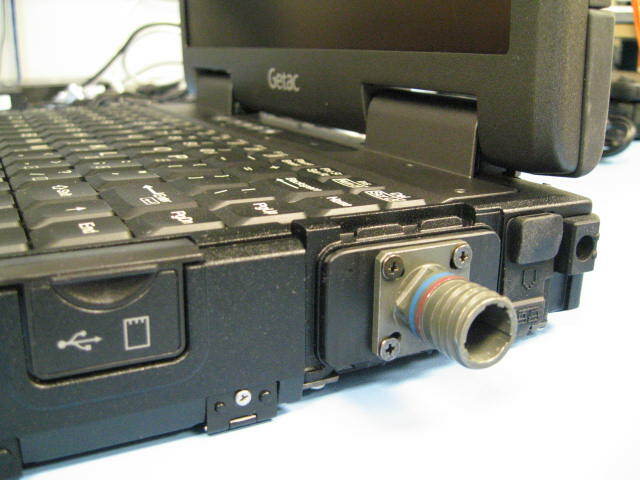 Pro Custom Group is Getac’s customization partner, and has produced multiple systems with mil-spec connectors.